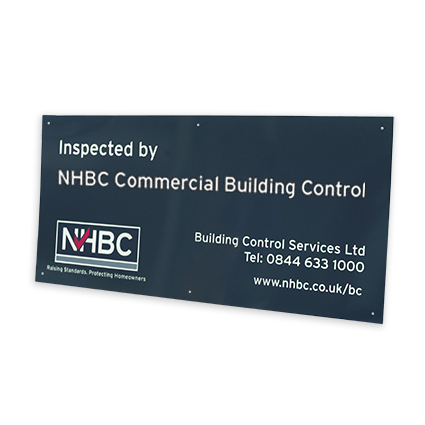 Show that your site has been inspected by NHBC Commercial Building Control and demonstrate your professional commitment by positioning this smart, durable NHBC Commercial Building Control site board (measuring 122cm x 60cm) near your site entrance. All our Building Control staff are chosen for their experience and passion for construction. We have dedicated commercial teams with the expertise to help you, whatever the type and size of your commercial project. NHBC Commercial Building Control works in a range of sectors including education, offices, healthcare and leisure. Projects are assigned a a qualified, experienced surveyor to act as a single point of contact, and teams are kept up-to-date with regulatory change.